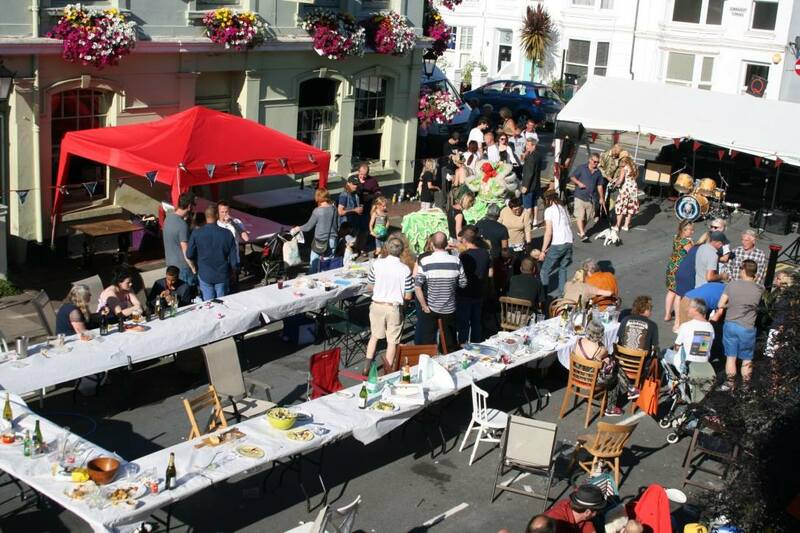 Each year my street has a summer party to which everyone in the street and adjoining roads is invited. I have managed to be on holiday for the last few years and have missed it. But this year I was at home and my cheery neighbours cajouled me into joining in. The sun came out and the street was transformed with bunting, removal of parked cars and trestle tables all lines up in a big square. I looked nervously out of the front room window for when it was to start and saw people had begun to sit down, bringing with them an assortment of dishes and bottles. It was time to enter the fray. My closest neighbours and myself plonked ourselves down at one end of the communal table with our contribution. I had made a salad and heated up a ready-made quiche. My neighbours had brought two huge boxes of tempting donuts. But what to do next? Where to start? We sat waiting for others to join and then hesitantly started to put a few bits of food on our plates and fill plastic glasses with Rosé wine. People seemed to be huddled in their own bubbles. We ate our food and then drank more. It all seemed rather uncomfortable and awkward – well at least for me. Then, Peter, one of my more sociable neighbours, had the bright idea of taking his box of donuts around the tables and offering them to people. That broke the ice. He came back beaming – having got an assortment of people to take up his offer. And suddenly the floodgates opened. Lots of people stood up with their dishes and started offering them to everyone. We were inundated with offers of homemade Victoria Sponge cake, strawberries, chicken dishes, cheese plates, salads and lots more. Everyone started sharing and competing with their offerings. Try mine – it is delicious. The conversations started to flow. I was stuffed not wanting to offend anyone. The pub started selling Pimms and the Tombola and raffle got into full swing. Then the band started playing, children started dancing, dogs ran crazy and the much hoped for conviviality was there for all to be a part of. The tables had turned. The openness and willingness to step out of one’s comfort zone – started by the offer of a donut – was a refreshing contrast to the depressing fallout from Brexit and world news of recent. I am even looking forward to the next one.